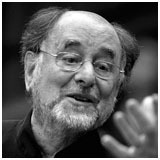 Sir Roger Arthur Carver Norrington CBE (1954), born 16 March 1934, is a conductor best known for performances of Baroque, Classical and Romantic music using period instruments and period style. He worked as a tenor through the 1960s, and in 1962 founded the Schütz Choir (later the Schütz Choir of London). From 1969 to 1984, he was music director of Kent Opera. In 1978 he founded the London Classical Players and remained their musical director until 1997. In the late 1980s he was Principal Conductor of the Bournemouth Sinfonietta and in the early 1990s music director of the Orchestra of St. Luke’s. In 1998, he became principal conductor of the Stuttgart Radio Symphony Orchestra and in 2006 Artistic Advisor of the Handel and Haydn Society. He is a member of the historically informed performance movement, advocating a limited use of vibrato in orchestral performances and following Beethoven’s own metronome markings in his symphonies. He has conducted recordings of Beethoven, Mozart, Schubert, Berlioz, and Brahms on period instruments. In 1984 he formed the Early Opera Project to complement his concert work in period-style performance. In September 2008 he conducted the Last Night of The Proms for the first time, and has been the Principal Conductor of the Zurich Chamber Orchestra since 2011. He was elected to an Honorary Fellowship of Clare College in 1990 and knighted in the 1997 Queen’s Birthday Honours for services to music. In 2012 he was awarded the Order of Merit of the Federal Republic of Germany, the only federal decoration of Germany, for his collaboration with the RSO Stuttgart.